Continuing or continuous professional development? I received a helpful reminder letter from the Chartered Institute of Internal Auditors (UK) in the last few weeks. It states that I should be aware that I need to do 40 hours of CPE (continuing professional education) for the CIA qualification and 20 hours of CPE for the QIAL. Some activities can contribute to both. I was concerned – why did the Institute feel the need to write to me to remind me? Had something changed? Was the guidance more strict? 60 hours seems a lot of formal CPE – two whole weeks? Surely learning comes from lots of different sources? Wow. Almost every day at work for me counts. So this guidance does not really specify which contribute to each qualification and which do not. What’s the balance between formal and informal CPE (the old chestnut of reading professional press etc). The template provided makes this no clearer either, just a simple table – surely a spreadsheet would make better sense? To maintain their knowledge and skills. To update their knowledge and skills related to improvements and current developments in internal auditing standards, procedures, and techniques or in their specialization area (government auditing, financial services, control self-assessment, or risk management assurance). To encourage understanding of The IIA’s International Standards, the Professional Certification Board (PCB) requires that certification holders incorporate review of The IIA’s International Standards as part of their annual CPE program. Certificants must review or receive training on The IIA’s International Standards during the CPE reporting period. In addition to reviewing the Standards, The IIA encourages individuals to review the Practice Advisories (accessible with an IIA member password) and other sections of The IIA’s Professional Practices Framework. Certified individuals will be asked to certify their conformance to the Code of Ethics and the International Standards as part of the annual CPE report submission to The IIA. These are less good in my view. The annual training on the Standards? Well they seem to change annually, so I guess any self respecting auditor should know about them – but formal training? Or is this something more informal? Also the Practice Advisories referred to are in fact not accessible to UK members from the US website or on the Global IIA website. There is also some lag between their publication from the US to the UK site. So does this mean I cannot certify to the Global IIA that I am compliant? Title of program and/or description of content. Location of course or program. Contact hours of credit as recommended by the course sponsor. A letter, certificate, or other written independent attestation of course completion. Documentation supporting publications, oral presentations, and committee or other participation. So this must be for courses – but this describes a very limited view of professional training and seems to narrowly focus on formal training courses. As I get older and more experienced as a CAE I learn more from doing and informal training than I do from formal training. Most training nowadays is not a formal classroom based thing in any case. Actively performing internal audit or related activities. This means I require 40 for my CIA, 20 for my QIAL and 20 for my CRMA (Certificate in Risk Management Assurance). I also hold the ITAC (IT Auditing Certificate from the UK IIA). This is not mentioned anywhere on the UK website. I’ve never been asked to pay anything for it, or return CPE. It does not attract post nominal letters, so perhaps that is why. Fees prices take some time to find and are difficult to obtain I found them here – however, just to report my CPE (just the admin cost of me filling a web form in the CCMS (Certification candidate management system) is $25 for the CIA and $10 for each specialty certification (my CRMA and QIAL in this case). So this is $45 just to fill in a form annually. These don’t seem to be to an annual cycle – reminders come in at various times – I assume all are due 31 December. On top of this I pay the UK Institute an annual fee – in my case paid through a corporate membership of the UK IIA of my audit service. This, from memory, was c.£250. CPE/CPD hours earned can be applied across all IIA Global designations, with some exceptions.  CFSA, CCSA, CGAP, CRMA – 25% of the hours earned must be related to the specialty.  QIAL – Some CPD categories for QIAL do not apply to other IIA global certification programs. So I need at least 40 hours. Of that 25% must be risk management oriented. Also I need some extra hours that pertain only to the QIAL. So what are these? So formal training courses (either internal or external) can contribute 20 hours to both CIA and CRMA. Again this is very narrowly drawn to be formal training courses with the requirements I set out above. Other categories include: maximum of 10 hours of contributions to publications; translations of technical materials (max 10 hours); oral presentations (max 10 hours); and performing an EQA (max 10 hours).  Contribution to external quality assessments. So tackling these eligible items: the delivery of training (max 10 hours); authoring of QIAL case study (max 10 hours); serving as assessor or panelist for QIAL (10 hours max split 5 hours for panel member and assessor respectively); being trained (max 20 hours); serving as a committee member for the IIA (max 10 hours); presenting (max 10 hours); authoring IIA publications (max 10 hours); translations (max 10 hours); and performing EQAs (max 10 hours). So what is all of this telling me? Well first I think it shows the transitional mess that the UK and Global qualifications are in. UK members are stuck somewhere mid-Atlantic with no real clear and single reporting route for CPD. Second I think the salami adding approach of certifications across the IIA needs to be streamlined into a single return to a single point. This should include a single fee. Third, I think the Global IIA needs to consider the value for money for its qualifications reporting – the fees are clearly above the administrative cost and their cumulative nature is not particularly fair on those members most committed to the Institute. Fourth I think the definitions of CPD need to be modernised, less restrictive and more focused on the real world learning. To get an external certification of an internal training course is challenging. Also as CAE for a large audit team, with auditors at many different levels of progression, a formal training course is not likely to occur or be helpful. Instead we have smaller learning groups and professional practices group that is more flexible. Fifth, the UK IIA says it makes sense to use your normal appraisal and development processes as applied in your organisation. These formal and restrictive CPE requirements do not play well into this. ‘Unlike some professional bodies, we don’t dictate how much CPD members must do. There are no set hours or points to attain. You simply need to complete as much development activity as you feel is required to remain competent in your role(s).’ See here. ‘You don’t necessarily need to attend training courses to maintain CPD compliance. We recognise that people learn in different ways, through several different channels. They have a ‘reflect, act, impact, declare’ approach. This treats the professional as a mature adult and enables a more reflective learning approach to be adopted. It also recognises that ICAEW members act in a variety of different roles, for which the training and CPD will look different. I am afraid all of this rather makes the IIA’s approach seem rather dated and unhelpful. It’s odd, given accounting has a much more restrictive remit and role than internal audit, so broader reflection would appear more appropriate for internal auditing than perhaps accounting. So what do I suggest? I suggest the UK and the Global IIAs take a step back from the labyrinthine CPD and qualifications structure they’ve created. I think a single point of fees and CPD declaration makes sense. Why not do this through the IIA UK and share data with the Global IIA? I think the administration fees need to be looked at, especially as UK members cannot access global resources, despite holding a global qualification. I also think the guidance on CPD could be made shorter, clearer, and in a single place. I take my CPD very seriously and it is a key priority for me and my audit team. The recent perturbation of UK IIA qualifications has been unhelpful and now needs to be tidied up and modernised, with clearer UK and Global integration. For the UK and Global Institutes in my view risk competition from other Institutes where they don’t make membership an easier and clearer proposition for busy internal audit professionals. I had a chat to my mentor this week. Having a mentor is fantastic, someone who can really challenge your perspective and give a completely objective view. As a CAE I think it’s necessary. Being a CAE can be a lonely role in any organisation and my mentor, being a world class CAE herself, is really able to understand how I, as a CAE, can feel sometimes. The challenge this week was to consider career development, mine for a change, as I spend a lot of time thinking about the careers of my audit team, both to ensure that they are being challenged, but supported, and that there are suitable career steps for them (and for my department to ensure it has enough talent pipeline to manage the exigencies of modern organisational delivery). I have tended to stay in my roles for a reasonable period of time, normally 6-8 years so far (I am always nervous of the two year mover – they never have to live with their work or decisions). This had made more sense as, when I was first a CAE in my own right, I was young for the role (29) and had lots to learn about management, audit methodology, auditing itself, corporate organisations and general technical stuff, and all that quite aside from the interest of learning a new organisation and its business. Yet now I am older I have the technical stuff (though every day is still a school day) and I have a strong and demonstrable record of management and audit management in a global context and at scale. Yet as I get older I find the ‘newness’ in roles becomes less. One of the great career boosting things about internal audit is that you can cover a whole organisation and never really have an ‘adult career’ being stuck in one part of an organisation. This ‘Peter Pan’ ability to look at everything as and when the fancy takes me (being CAE has some freedoms as well as a lot of pressure and limitations) suits me. I have a short attention span and like solving problems. Once solved, I like to move onto the next thing. [Just for the record that does not mean I don’t see things through or have a forensic eye for detail when needed (for any potential recruiters reading this) but that my natural style is inquisitive.] I think that’s why I loved doing my MBA so much. This ability to reinvent roles and the ability add things (non executive roles, charitable roles, study, representation in organisational groups etc) has meant that I have been able to change roles relatively infrequently, whilst actually varying my role quite significantly in post. I have now added counter fraud at scale as a significant element to my current role and this has been a new area of interest and development for me. There is little technical and established practice out there, with counter fraud work being relatively (compared to internal audit) immature. So it has given me a chance to invent the wheel and work out what works best. Yet I do feel, as I become more senior, a pressure to take on new roles with more frequency. Each time I do this, I seem to have the same challenge; that of turnaround. I seem to find each audit department I take on needs to establish itself in the business, release the talent of the current staff, add talent from new staff and structure, improve its methodology, improve its client organisation’s risk management, and generally improve to be business relevant. Internal audit done well, I believe, is a must have for competitive and delivery advantage for any organisation. It just makes sense from a CEO and governance perspective. So am I a turnaround specialist? Should I only be happy when reforming and enhancing a department, or can I take pleasure, challenge and satisfaction from running a good department as well? As the turnaround task becomes easier with practice, perhaps my lifecycle of role satisfaction is decreasing. I think all of the greatest internal auditors are ‘architects’ (a term helpfully provided to me by my current deputy). What do we mean by this? Well it is the ability to set or identify strategic objectives, then diagnose the problem, identify the broad principles of a solution, and finally to put in place a set of coherent actions to deliver this. Architects need the ability to envisage (or envision if you’re American) something that is not there. This is not just an internal audit skill at a leadership level, it is one each internal auditor should have at each level. Auditing what is there is easy, auditing what is not and what should be, is much harder. I think it is that ability and emphasis that marks out internal audit as a profession from our management and other professional colleagues. So in my CAE role I do act as an architect, in every paper, audit report, technical and risk challenge I face. Thinking about blank pages and filling them is tiring however, and I am lucky that I have a team with lots of this capability itself. Perhaps it is doing this stuff that keeps me challenged and interested? So perhaps the challenge is to find enough building in my role to keep me interested, for once a building is built, it requires little architectural input. Internal audit as a profession is one that, uniquely, has significant capacity to challenge and develop, so I feel sure that this is possible. So what have you built lately? Mindful (comparative more mindful, superlative most mindful). Being aware (of something); attentive, heedful. I think internal audit and auditors have a natural predisposition against being mindful. We are trained to be dispassionate and objective. We value not getting emotionally connected or engaged with the subjects we audit. We are naturally competitive. We as auditors are always looking for how something can be improved and looking for non compliance, fraud, error, sub optimality of any type. We are trained to be professionally sceptical. We don’t take things at face value and we challenge the status quo. All of these things incline us to be less mindful of our clients and colleagues. When you become a CAE the tables are turned. Suddenly mindfulness is helpful and useful. As a CAE, I have written before on this blog about working out how reports and messages will ‘land’. A good CAE should be able to work out how their work will impact the organisations and individuals in the client organisation. I have in the past become frustrated by what I call fake mindfulness. That is, where people become bland, do not have opinions, are not open and honest with each other and see all feedback as criticism. Often management teams fall into this trap. This is not a good place for an organisation to be in, where honest and open debate is not allowed, promoted or engaged with. Sure not every decision can be endlessly debated and challenged, but equally no challenge leads to organisational atrophy and group think. It can be frustrating as a CAE to see problems that are not tackled all to avoid conflict or uncomfortable situations. Ultimately they can impact organisational culture and performance. There has been much written about the risk taking culture in Barclays and other banks, for example. So in my view a good CAE must be able to deliver difficult and challenging messages. Some in our profession actually go into the personally brave mode, to tell organisations about serious problems and are threatened, harassed and sacked for doing so. Yet a CAE must be both brave, honest and mindful. As I have progressed in my career I have come to understand the world is a lot greyer than I previously imagined it. The world is not black and white, right and wrong. Differences of opinion are to be celebrated, endorsed and validated and mutually acceptable. I have also come to understand organisations in greater depth and see people, not processes or systems, as the core of how organisational control works. This means understanding people. As a CAE I also manage an audit team. This means managing people. People who are generally excellent and committed to excellence, but who all have lives, families, partners, health and social issues, pressures and stresses and different opinions. So the immediate prima facie reaction and consideration of staff issues I have learned is not always massively helpful. As an example, I travel on planes a lot. At the end of the flight, once the plane has taxied into the stand, those in the aisle stand up and get their bags ready. they queue in the aisle to depart. I have a simple rule that rushing will not help, pushing past others is not useful, and for those by the window, being given a few moments to get up, put your coat on and get your bag out of the overhead locker is really helpful. So I am mindful, on the basis of fairness to always stop the aisle queue when I am head of it and allow those in the row in front to get out. As I got up this evening a lady was by the window seat in the row in front. When the others in her row had all gone, she looked at me and paused. I simply gesticulated for her to feel free to get out and get her bag, stopping the aisle queue behind me. As she got up, I noticed she was disabled and walking took great effort. She was so grateful for my courteousness. I did not know she was disabled, she was sat down and had boarded the plane before I had. Yet I felt so much compassion and admiration for her and she descended the steps, with great difficulty, off the plane and then walked to the terminal. Had I not been mindful and courteous I would have felt awful had I pushed past or been grumpy to get off the plane. So it is with audit clients and with team members. We should always try to anticipate or seek to provide space to understand that people are complex and have all sorts of things going on in their lives. This is not a charter for a less demanding or lower standards audit, but more a recognition that the world is complex and not simple, and that other, perhaps more plausible or difficult explanations, may emerge for issues risks or performance difficulties. As another example, my audit teams travel internationally. They are away for up to two weeks, working and socialising with their colleagues. Now this is difficult territory. For in that space in the evenings my teams are neither fully in work, nor fully at home. They can be tired, stressed, sometimes ill and missing home. So we, as an audit team, need to cut our colleagues a little slack. Sometimes people are grumpy or relaxed and don’t stick to the same style they would in the office. This is fine as long as colleagues are mindful and understanding. 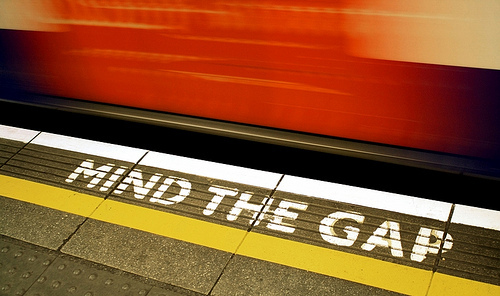 Whilst being mindful of others does not come naturally to us as auditors and I think modern management mindfulness, practiced to becoming organisationally bland, is unhelpful, I do think we should mind the gap between our training and our practice. Do you?